I’ve been having the hardest time keeping this incredible inspiration shoot under wraps. The ever-impressive Tanti from Papertini approached me with the idea of a modern wedding twist on Little Red Riding Hood and I couldn’t help but jump at the opportunity. We were one of the first people to get into the new Peachtree and Ward venue, Pomme, in Radnor. I’ll have a full post on the shoot soon but I wanted to wait until it was published somewhere first! 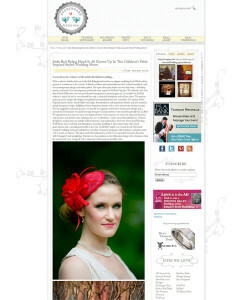 You can see it today as the feature story over at Storyboard Wedding. You are not going to want to pass up this innovative and romantic twist on the dark fairy tale. Go check out The Fab Bride right now. They posted even more images from Mike & Stacy's elegant Wedding at Stotesbury Mansion last month. 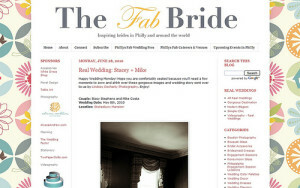 It's an awesome blog for all you Philly brides – it highlights tons of Philly-centric real weddings and plenty of wedding ideas. I am honored to have been asked to be a part of this awesome blog! If you want the epitome of rustic yet elegant and beautiful wedding style, I have the inspiration shoot for you! In a collaboration with Proud to Plan, Papertini, Cheekadee, Van Cleve Wedding Pavilion, and Laurita Winery, we made a gorgeous multi-scene shoot. There were lace doilies, burlap, mason jars, bunting signs, and mercury glass all tied together in one sweet package. The fact that a shoot from 2011 is still causing a splash in 2014 just goes to show you how timeless these elements can be. 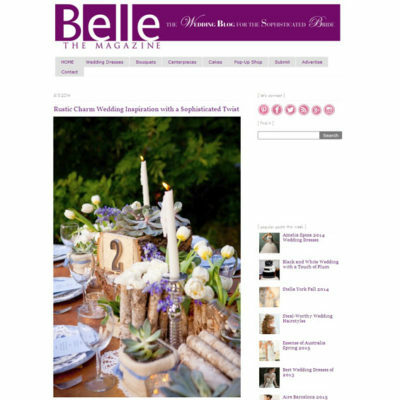 We're so happy to see our beautiful shoot in Belle the Magazine! 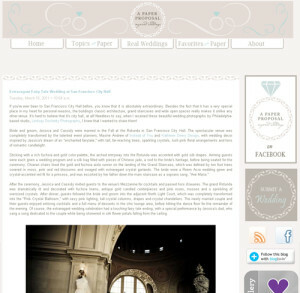 I’m just delighted to have a wedding featured on the fabulous new wedding blog, A Paper Proposal. Of course you’ll remember Jessica and Cassidy’s splendid San Francisco City Hall wedding. Run on over to A Paper Proposal to check out more images and peruse this blog for all sorts of classy and chic wedding inspiration! This is definitely a blog you’ll want to bookmark!